The SURFACE function draws a three-dimensional surface for a two-dimensional array of data. Instead of data, you can also input an equation of X and Y using either the input argument or the EQUATION property. In this case IDL will automatically generate the independent X and Y values and use your equation to compute the dependent Z data. The following lines create the graphic shown at the top of this topic. See Surface, contour, and vector examples for additional examples using the SURFACE function. The SURFACE function returns a reference to the created graphic. Use the returned reference to manipulate the graphic after creation by changing properties or calling methods. A vector or two-dimensional array containing the surface heights. If Data is a vector, then X and Y should also be vectors of the same length, containing the x and y coordinate of the corresponding points. A vector or 2D array containing the x-coordinates of the data. If Data is a 2D array and X is a vector, then each element of X specifies the x-coordinate for a column of Data. If X is a two-dimensional array, then each element specifies the x-coordinate of the corresponding point in Data. A vector or 2D array containing the y-coordinates of the data. If Data is a 2D array and Y is a vector, then each element of Y specifies the y-coordinate for a row of Data. If Y is a two-dimensional array, then each element specifies the y-coordinate of the corresponding point in Data. If Data, X, and Y are vectors with the same number of elements, then the data is assumed to be irregularly spaced. If Data, X, and Y are two-dimensional arrays with the same number of elements, then the X and Y coordinates will be tested to determine if the points are regularly or irregularly spaced. IDL calls the QHULL procedure to construct the Delaunay triangulation. If GRID_UNITS="degrees" then the data is assumed to lie on a sphere, and the SPHERE keyword is passed into QHULL. The graphics function then constructs an output grid. The number of points in the X and Y dimensions is automatically determined from the average number of points in the original X and Y data. IDL then evenly distributes these points across the corresponding range of the X and Y coordinates. 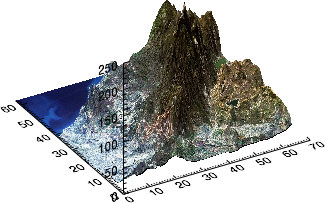 IDL calls the GRIDDATA function, using the Delaunay triangulation and the regular grid. For speed, the Natural Neighbor method is used. For non-spherical data, we then compare the interpolated data to the minimum and maximum of the original data. Data points are assumed to be "poorly" interpolated if they lie outside of 10% below the minimum or 10% above the maximum of the original data. If more than 10% of the points are poorly interpolated then IDL throws an error and halts execution. Otherwise, IDL passes the bad data points back into GRIDDATA and uses the Linear method, which is slower but more accurate. You can pass in a named variable to the IRREGULAR keyword to determine if automatic gridding was performed. You can retrieve the gridded results using the ::GetData method. Depending upon the dataset, the automatic gridding may fail or may produce displeasing results. In this case you should do the gridding yourself, perhaps using a different gridding method to GRIDDATA. If the first argument is a string, then it is assumed to represent either an equation of X or the name of an IDL function that accepts an input argument X. Setting this argument is the same as setting the EQUATION property. See EQUATION for details. Set this keyword to 1 to force the data to be gridded onto a regular grid. Set this keyword to 0 to disable automatic gridding. By default, if this keyword is not specified, then IDL will automatically grid the data if the X and Y locations are not on a 2D evenly-spaced grid. Set this keyword to an array containing an image to be texture mapped onto the surface. If this property is omitted, no texture map is applied and the surface is filled with the color specified by the COLOR or VERTEX_COLORS property. The image array can be a two-dimensional array of color indexes or a three-dimensional array specifying RGB values (3 x n x m, n x 3 x m, or n x m x 3) or RGBA values (4 x n x m, n x 4 x m, or n x m x 4). By default anti-aliasing is used when drawing lines for mesh or ruled style. Set this property to 0 to disable anti-aliasing. A floating point value indicating the ratio of the Y dimension to the X dimension in data units. If this property is set to a nonzero value, the aspect ratio will be preserved as the graphic is stretched or shrunk. The default value is 0, meaning that the aspect ratio is not fixed, but is allowed to change as the graphic is stretched or shrunk. A floating point value indicating the ratio of the Z dimension to the X and Y dimensions, in data units. If this is a nonzero value, the aspect ratio will be preserved as the graphic is stretched or shrunk. The default value is 0, meaning that the aspect ratio is not fixed, but is allowed to change as the graphic is stretched or shrunk. Set this property to a string or RGB vector that specifies the surface bottom color. The default behavior is to make the bottom color match the COLOR property. Set this property to a string or RGB vector that specifies the surface color. Set this property to a two-element vector [bright, dim] specifying the near and far planes for depth cueing, in normalized units. Depth cueing causes graphics objects that are further away to fade into the background. The first element is where the fade starts to take effect, while the second element is where the objects are completely transparent. Negative values are closer to the eye, while positive values are farther from the eye. The default value is [0, 0] which disables depth cueing. A typical value would be [0, 1], which would cause objects to start to fade at the mid-plane of the window, and completely fade out at a normalized eye distance of 1. Set this property to a scalar or two-element array giving the number of samples to use in the X and Y dimensions with the EQUATION property. If a scalar is specified then the same value is used for both dimensions. A higher value will give a smoother surface but will be slower to compute. The default is 200 points in each dimension. This property has no effect if EQUATION is not set. Set this property to an expression containing data of any type. If EQUATION is set to a function and EQN_USERDATA is set, then the value of EQN_USERDATA will be passed in as the third argument to the function. If EQUATION is not set, or if EQUATION is set to an expression of X and Y, then this property will have no effect. Set this property to a string that contains an equation. The equation can either be a valid IDL statement that has variables named "x" and "y", or the name of a function that accepts two arguments, X and Y. Note that your IDL statement (or function) must be able to handle two-dimensional arrays of X and Y values. In other words, all of the X and Y values are passed in at once, not individually. The result of evaluating the equation with X and Y should be another two-dimensional array containing the surface height data. When the surface is displayed, IDL will automatically construct two-dimensional arrays X and Y that span the current axis ranges. The initial range is [-10, 10] in both X and Y. If EQUATION is an expression, then IDL calls the EXECUTE function once with the X and Y arrays. Note that in certain circumstances (such as the IDL Virtual Machine), you may not be able to use the EXECUTE function. If EQUATION is a function name, then CALL_FUNCTION is called once with the X and Y arrays as input arguments. The function should return a two-dimensional result array. Once the equation is evaluated, IDL examines the result for any NaN values, and then the X and Y ranges are clipped to only cover valid regions. The equation should be a "single" IDL statement (the "&" can not be used). If you need multiple statements, you should construct a function that accepts two arguments, X and Y, and put all of your code within the function. If you change the X and Y axis ranges using the XRANGE or YRANGE properties, then a new set of X and Y values is constructed and IDL calls your equation again with the new values. You can use EQN_SAMPLES to control the number of sampled points in each dimension. You can use EQN_USERDATA to pass in user-defined data to your function. For a more detailed example see Dynamic Visualizations. 0 or "" - None. The surface coordinates are in arbitrary units that are not tied to a map projection. The units will have no effect on the automatic grid. 1 or "m" or "meters" - Meters. The surface coordinates are in meters. Just like GRID_UNITS=0, the units will have no effect on the automatic grid. 2 or "deg" or "degrees" - Degrees. The surface coordinates are in degrees longitude/latitude on a sphere. In this case, when gridding irregularly-spaced data, IDL will assume a spherical grid. Note: The GRID_UNITS property only determines whether the data is treated as lying on a sphere when IDL computes the regularly-gridded data. Once the data has been interpolated to a regular grid, the GRID_UNITS property has no other effect. Set this property to draw point and wireframe surfaces using hidden line (point) removal. By default, hidden line removal is disabled. The maximum value to be plotted. If this property is set, data values greater than the value of MAX_VALUE are treated as missing data and are not plotted. Note: The IEEE floating point value NaN is also treated as missing data. The minimum value to be plotted. If this property is set, data values less than the value of MIN_VALUE are treated as missing data and are not plotted. Set this property to 1 to enable a perspective graphics projection. In the perspective projection, objects that are further away will appear smaller. The default is 0, which is the orthogonal perspective. Set this property to 1 to use Gouraud shading, or to 0 (the default) to use flat shading. In flat shading the color has a constant intensity for each face of the surface, based on the normal vector. In Gouraud shading the colors are interpolated between vertices, and then along scanlines from each of the edge intensities. Gouraud shading may be slower than flat shading, but results in a smoother appearance. Set this property to 1 to draw a skirt around the edges of the surface, at the given SKIRT value. Set to 0 (the default) to disable drawing the skirt. Set this property to the Z value of the bottom of the skirt. On creation, if SKIRT is set, then SHOW_SKIRT will automatically be set to 1. Set this property to a nonzero value to indicate that bilinear sampling is to be used with texture mapping. The default method is nearest-neighbor sampling. Set this property to a value between 0 and 10 that specifies the line thickness of the surface lines. A thickness of 0 displays a thin hairline on the chosen device. The default value is 1. Set this property to a string specifying a title. The title properties may be modified using FONT_COLOR, FONT_NAME, FONT_SIZE, and FONT_STYLE. After creation the TITLE property may be used to retrieve a reference to the title text object, and the TEXT properties may be used to modify the title object. An integer between 0 and 100 that specifies the percent transparency of the surface. The default value is 0. A vector of colors to be used to specify the color of a surface vertex. The vector may be of the form [n*m] or [n, m] where each entry is a color index, or of the form [3,n*m] where each 3-element row is an RGB color, or of the form [4,n*m] where each 4-element row is an RGBA color. To remove vertex colors after they have been set, set VERT_COLORS to a scalar. If VERT_COLORS is not specified, the entire surface is drawn in the single color provided by the COLOR property, which is the default action. If this keyword is set to a vector or a two-dimensional array of equal size to the data, these values are indices into a color table that can be specified by the RGB_TABLE keyword. If more vertices exist than elements in VERT_COLORS, the elements of VERT_COLORS are cyclically repeated. A two-element vector giving the X data range to plot. The default behavior is to plot the entire data range. A two-element vector giving the Y data range to plot. The default behavior is to plot the entire data range. A two-element vector giving the Z data range to plot. The default behavior is to plot the entire data range. Added automatic gridding of irregularly-spaced data, the IRREGULAR keyword, and the GRID_UNITS property. Added Equation argument, and EQUATION, EQN_SAMPLES, and EQN_USERDATA properties.